With: Maral Noshad Sharifi (moderator), Charles Esche, Ehsan Fardjadniya, Erik Hagoort, Gluklya and others. Settling in a new country requires a lot of perseverance, but after (sometimes years) of oppression, refugees often show a great deal of resilience. Oppressed energy makes way for new expectations for the future and the willpower to build a new life. But does our current society encourage or frustrate this vitality? When does someone stop being a refugee and are they free to realize their potential? And how can art play a role in stimulating this potential? On Thursday December 14, we invite everybody to come to the Tolhuistuin to discuss this subject. 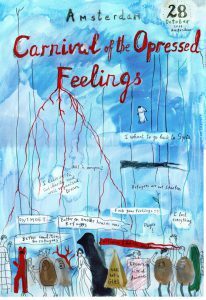 The debate is inspired by the Carnival of the Oppressed Feelings, and prior to this, the 5 Day Program. 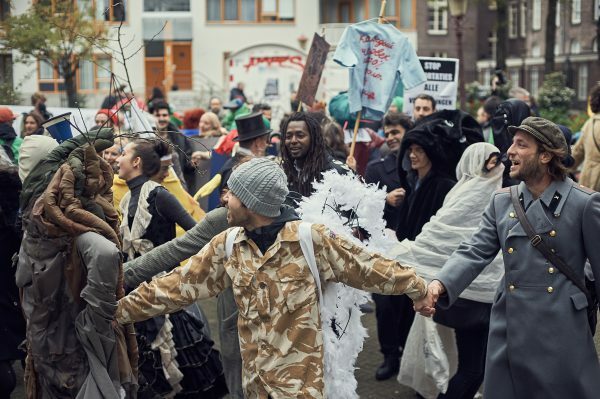 On Saturday October 28, during the Carnival of the Oppressed Feelings people marched from the Bijlmerbajes to Dam square, thus uniting refugees, artists, organizations and anyone interested. With this performative demonstration, Russian artist Gluklya (Natalia Pershina-Yakimanskaya), in co-operation with TAAK, wanted to make a statement to welcome refugees, but also give them a face and a voice in the public domain. The costumes, especially made for the carnival, expressed the fears and frustrations newcomers experience in a strange country while the carnival itself served as an outlet for oppressed emotions. On December 14, the film made about this event will be shown, followed by a Q&A with the artist. Next, several experts will formulate a statement and invite the audience to participate in a debate. The event on December 14 is entitled Play Back Talk Back, a new initiative by TAAK. Deriving from the wish to analyze the impact of art projects in public space at both artistic and social levels, Play Back Talk Back is a tool to share experiences and reflections with experts and audiences through debates, essays, videos and articles. 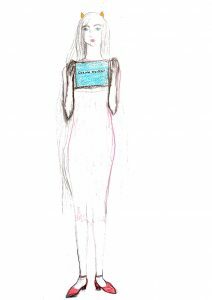 In doing so, we create a new on- and offline platform where knowledge about social issues deriving from the art projects is collected. More information on Play Back Talk Back can soon be found at the (renewed!) TAAK website. 8.30 pm Panel with various guests giving statements among which Charles Esche, director Van Abbemuseum and the Kurdish-Iranian-Dutch artist Ehsan Fardjadniya. If you want to sign up, please send an e-mail to: info@taak.me, or sign up at the Facebookevent. Entrance is free. Ehsan Fardjadniya (1980) is a Kurdish-Iranian-Dutch artist. He holds a Bachelor from the Royal Academy of Arts in The Hague and a Master from Goldsmiths University in London. He works in the fields of participation art, interventions in public space, performances, video art and experimental film. Because of his artistic and activist practices, he had to flee from Iran in 2000. Since then he lives and works in Amsterdam and Londen. This program was made possible with the support of the Mondriaan Fonds and the Amsterdams Fonds voor de Kunst. Carnival of the Oppressed Feelings, October 28, photo: Vika Uskhanova.